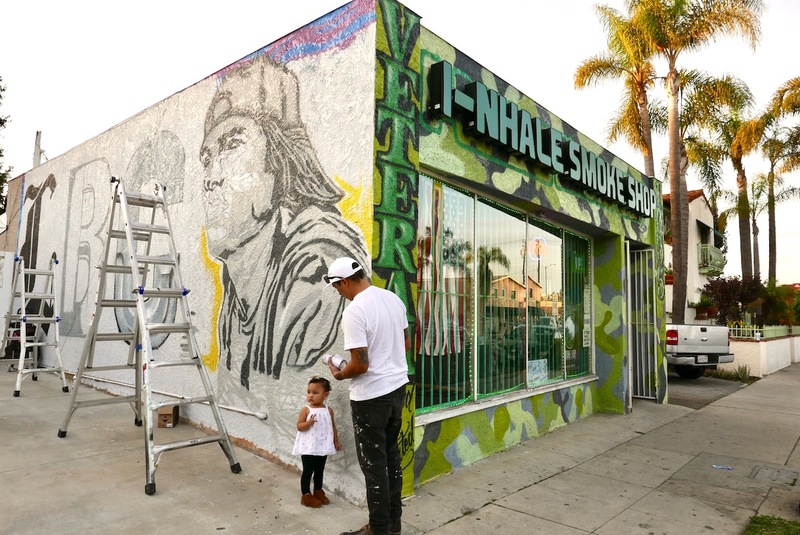 Artist Erick Guadarrama's almost 2-year-old daughter, Theresa, helps with the portrait of Long Beach native, philanthropist and music producer Tito Rodriguez at i-nhale Smoke Shop. Saturday, Jan. 26. Photo by Asia Morris. Cars on Redondo Avenue near 10th Street noisily speed by on a Saturday afternoon, as artist Erick Guadarrama works on a larger-than-life portrait of Tito Rodriguez, the Long Beach native, philanthropist and music producer. “I feel like he’s part of hip hop history, a Hispanic guy that should be credited,” said Guadarrama. Growing up in Long Beach, Rodriguez lived next door to Goldie Loc, one-third of the hip hop group Tha Eastsidaz—made up of former Death Row Records artists Snoop Dogg and Tray Deee who left the label to start their own group. The two worked together in the ’90s hip hop scene, Goldie Loc as a rapper and Rodriguez as a producer. Later on, Rodriguez started a punk band called The Pricks and has since dipped his hand in many creative projects, but for the past several years, his goals have focused more on philanthropy. 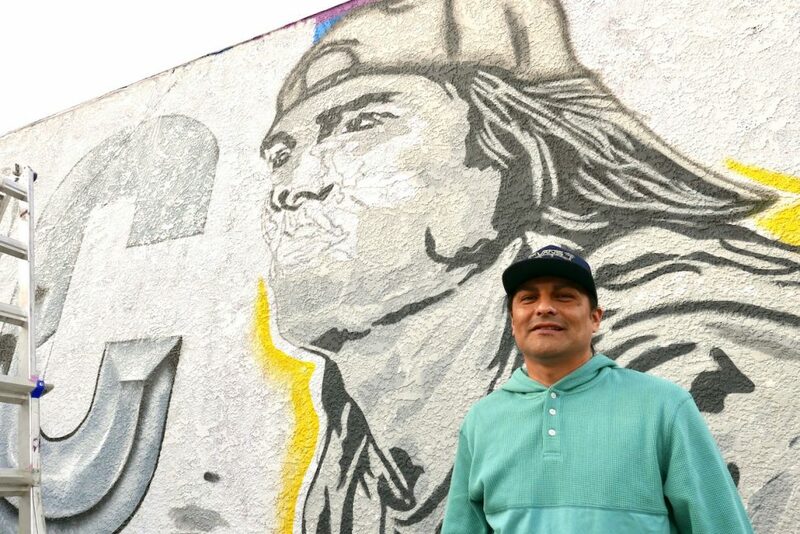 Long Beach native and music producer Tito Rodriguez stands in front of his unfinished portrait at i-nhale Smoke Shop. Saturday, Jan. 26. Photo by Asia Morris. In December, Rodriguez was given a certificate of recognition by the City of Long Beach for his work as the “Hood Santa” and participating in the 8th Annual Diamond Christmas Toy Giveaway at the Women’s and Children’s Clinic, put on by Local Hearts Foundation. As one of the foundation’s founders, he was given the nickname while engaging with the local community in Long Beach and South Central L.A.; visiting homes to give away gifts to kids. “It’s a pretty cool transition to go from making music to ‘hero work’ as I like to call it, or trying to help people that need a little help during the holidays,” Rodriguez said. 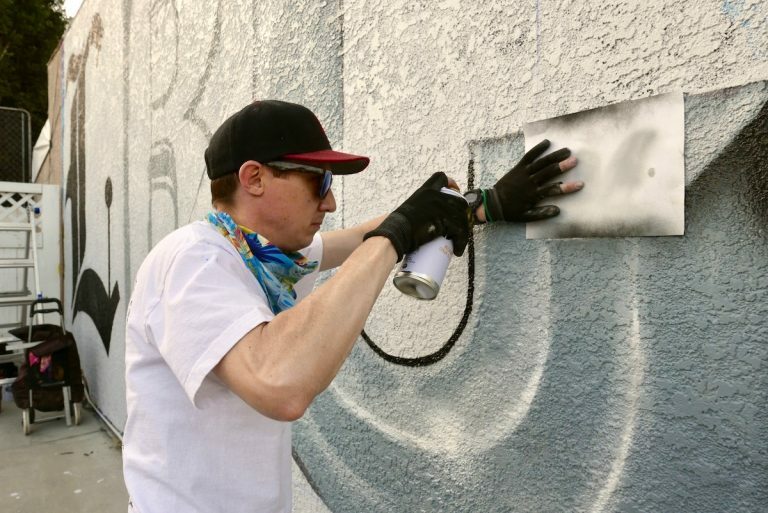 Guadarrama combines hip hop, Hispanic heritage and Long Beach culture in the new Eastside mural at i-nhale Smoke Shop, a small business owned by military veteran and arts supporter Robert Hernandez. Guadarrama has painted many murals around town, including multiple portraits of Frida Kahlo and Diego Rivera. 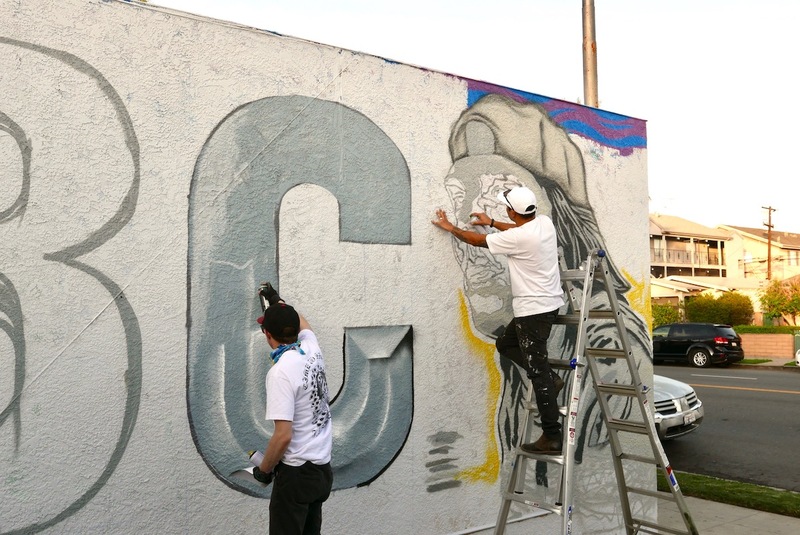 Another local artist, known as “Howdy Y’all,” perfects his West Coast- and block-style letters, “LBC”, while a small group of friends and family spend time in the tiny parking lot, chatting and watching the process as the sun begins to set. 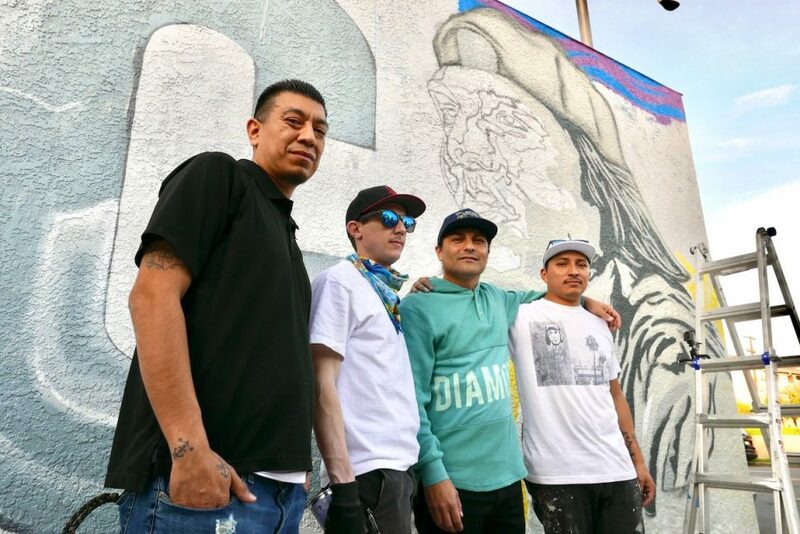 From left, i-nhale Smoke Shop owner Robert Hernandez, artist J. Blanks, known as “Howdy Y’all”, music producer Tito Rodriguez and artist Erick Guadarrama. Saturday, Jan. 26. Photo by Asia Morris. 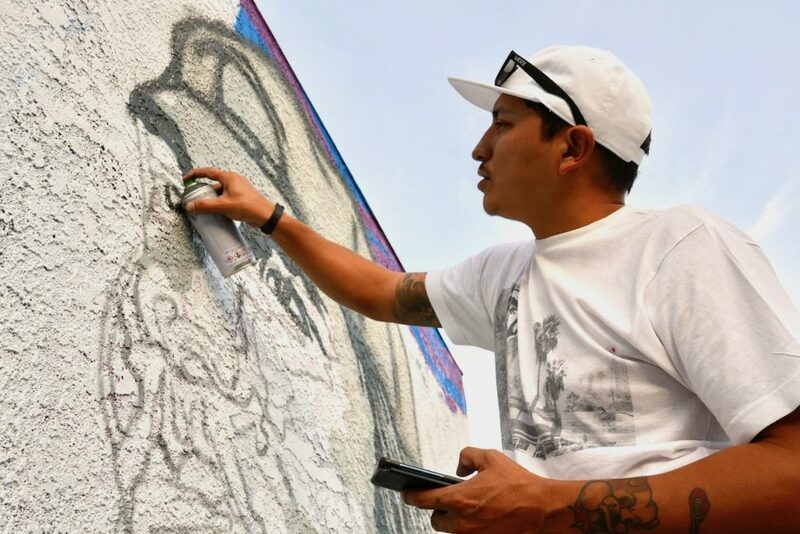 Those wanting to check out the mural at 1055 Redondo Ave. can expect it to be completed by Saturday, February 2, Guadarrama said. Learn more about his work on Instagram @sparc_eg and check out Howdy Y’all @howdyall and Rodriguez’ work in the community @thehoodsanta.